But as we removed the driver from the equation it opened the door to a vast array of new types of businesses that separate themselves from a permanent location. Retail is undergoing a major transition. With reports that 3,500 stores will be closing this year in the U.S. alone, and some speculating the real number may indeed be three times higher, seasoned entrepreneurs are beginning to sniff around the edges to find emerging opportunities. Today’s storefronts are a throwback to yesteryear. Commercial building owned by wealthy landlords, highly regulated by cities with signage, zoning, and code level restrictions, requiring years of prep work to construct and a similar timeframe to modify or change anything on the property. Because of this, landlords have been in a unique position. With commercial properties relatively scarce, and good buildings in high traffic locations even scarcer, most landlords prefer to hold out for Fortune 500 retailers to sign a 15-20 year lease that requires a team of lawyers to review before anything gets signed. The commercial real estate system has evolved into a super complicated, top-heavy industry governed by national brands and global suppliers. As a result, most little-guy merchants don’t stand a chance. At the same time, the buying public is a mercurial bunch. People love to shop at places that are new and different. They love to be surprised by their experience, and they are willing to pay for those surprises. The mobile food truck industry has paved the way for a much larger industry. Gone are the days where stores could simply warehouse products for shoppers to buy. Retailers need to provide customers with a feeling of excitement, exclusivity, and a tell-your-friends remarkable experience. Traditional shopping centers have become stagnant. Sure, some of the displays change along with the merchandise, and occasionally a store is replaced by another store, but the pace of life is much faster than the glacial speed that transforms the fashion racks at Macy’s. When it comes to retail, we don’t remember an evolution, we only remember a revolution. NOTE: What you’ll see below are images of existing mobile businesses. Once driverless technology kicks in, these mobile businesses will take on some radically different designs. The idea of mobile mall shops started with rural communities. In most small towns the customer base is too low to warrant a full-time presence and permanent location. But a one-day-a-week storefront in five or six communities might be a perfect arrangement. For this reason, it’s not a stretch to envision a new form of shopping center that caters to mobile businesses. With a stationary common area at its core, the mobile mall will be a central gathering place where a variety of businesses can “plug-in” and set up shop. 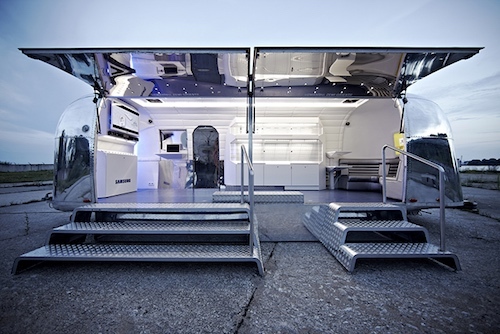 RVs, trucks, vans, and other large vehicles can be converted into traveling dental offices, tax preparation centers, chiropractic clinics, and retail storefronts. As they pull into place, merchandise and service areas will expand into the common area creating an “open bazarr” feel for the shoppers. 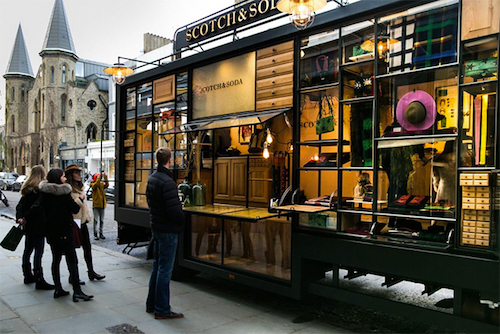 Most of the traveling storefronts will be one or two person businesses, nomadically traveling from city to city on their daily business adventure. Others will work a regular circuit, showing up on the same day each week, building a loyal customer base. This type of business can be used as both a laundry service for travelers and a promotional tool for companies demoing new laundry products. Bicycles are popular all over the world and it’s quite amazing how a mobile operation can open up so many possible revenue streams. No need to go out to the local liquor store when you can summon an entire brewery whenever and wherever you want. The local watering hole just got a lot more neighborly. Wherever there’s a crowd there are wants, needs, and desires, and mobile vending machine services can be there to help. As every DIYer knows, good hobby shops are filled with experiences-waiting-to-happen. These experiences can be formed around kits, plans, pieces-waiting-to-be-assembled, raw materials, and all the tools necessary to trigger a fertile imagination. Think of it like a bookmobile only these shops are designed to bring rapid prototyping to school kids. When it comes to consumables, drinks are an easy sell and these storefronts typically develop a higher frequency of visitation than any other type of product. Most things we own will need fixing, repair, or improvement at one time or another. Mobile businesses like this will soon become a common sight. Think of this as tiny convenience stores or fruit stands that can pop up anywhere. Niche products and specialty foods for the farmer’s market mindset. Every big-time convention that rolls into town will soon be able to accommodate far more people when additional hotel rooms can be summoned as easily as the guests who will be using them. FEMA will also like the idea of self-driving homes as a way to provide instant housing whenever a disaster occurs. It won’t take long for people managing complex operations to realize that if one drone is effective, a dozen or two can produce far better coverage. Managing a fleet of commercial drones will be far different than working with today’s one-off hobbyist quadcopters. Fleets will only come into play once automated systems enable less-skilled operators to manage their own equipment. Fleet operators will find themselves needing a command center with skilled personnel such as pilots, logisticians, and data analyzers, but piloting the drones themselves will be automated to the point of needing little supervision. Every service we use on a regular basis will soon have a mobile version visiting our community. 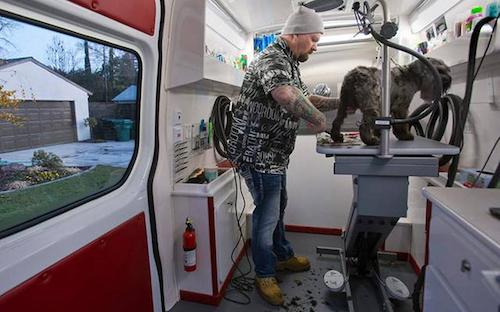 For many people, pets have become an integral part of their family, and pet services have become a routine part of modern living. Entertainment comes in many forms and turning it into a mobile experience opens up a wide range of opportunities. National and global events have become a key part of our social structure. One large video screen is all it takes to attract likeminded people and turn a simple broadcast into a community event. Certain products inspire unusual levels of loyalty and people who closely follow these products are always looking for the next great innovation. People love to talk to experts to get answers for those nagging questions that create a cloud of uncertainty around most products. Apple stores are a perfect example of “experts shops” because each of their employees is a true expert on the products they sell. While Apple uses several elements to attract and engage buyers, the expert-to-consumer relationship is a key feature. Other companies like Amazon and Google are looking to replicate the Apple experience, but they will have an uphill battle. Unless something major changes, Google will ultimately fail with their retail experiment because they have little respect for two-way communications. If you’ve ever tried to contact Google you’ll know what I mean. In the end, retail is all about two-way communications. One major expense in traditional retail has been inventories and shelf space. For this reason a new breed of storefront will spring to life, with no inventory, focused solely on product demonstrations and same-day fulfillment. While most people think in terms of cooking demos with chef’s talking about the food and cookware that they’re using, Demo Shops will include everything from athletic equipment, to toys, to hardware, to appliances, and more. Will there be a mobile business in your future? On a recent shopping trip, I went to three separate stores to find an unusual product. With each in-store experience I tracked down a sales clerk and they told me about an option that either wasn’t apparent to most customers, or that I hadn’t considered. Yes, the online retail is stealing a growing percentage of business, but people-to-people interactions still matters. However, it’s mattering less, and pricing competition is making the people-to-people option a luxury. When it comes to retail, consumers are in control. They decide what to buy, where to buy, when to buy, and how much they’re willing to spend. Physical stores still provide the best way to create a high-value relationship with customers that add to the brand experience, but in addition to online sales, they will soon find new competition in the form of mobile storefronts. As the driverless era kicks into high gear, our thinking about proximity, place, and location will also shift. Will bricks and mortar retail survive? Yes, in some form, but it may end up far different than anything you can imagine.